As I continue to get to know Angus, I am impressed with how he did so well coping with the difficulties he was having. It’s clear to me that this horse is communicating discomfort. I have yet to meet a horse that has “behavioral problems” that didn’t have some physical issues that went un-diagnosed(Primarily Ulcers and hoof issues). He has been giving me his all and getting better and better. As I mentioned before, his Self Selections we’re pointing to pain and digestive issues. I had a hunch that he might have ulcers (putting the physical and historical information together) and I was finally able to get our Chinese Medicine vet Dr. Perdrizet (of Sanctuary Animal clinic in Holyoke, MA) to have a look at him. He confirmed my read on him and why his insides didn’t match his outside appearances. People what I am about to tell you is SO important to reiterate time and time again. Angus looks and acts like a basically healthy happy horse, until you ride him. He is personable, relaxed in his environment, eager to please and eats well. He is borderline overweight and he has Ulcers. 90% of all horses can have ulcers. This is why we have to look under the hood. For my foreign friends, looking under the hood means (in reference to a car, lifting the hood up and checking the engine and other parts to make sure they are really functioning well) A car and a horse can look shiny, polished, well cared for and have a blown engine. I see it ALL THE TIME. So Angus’s problem was side sensitivity and reactivity to the leg. Interestingly enough he does not exhibit girthiness and only shows some subtle tension around saddling (which a lot of people would miss). It was no surprise that he leaped forward in pain at the feeling of people’s legs on his sides and especially on his left side. 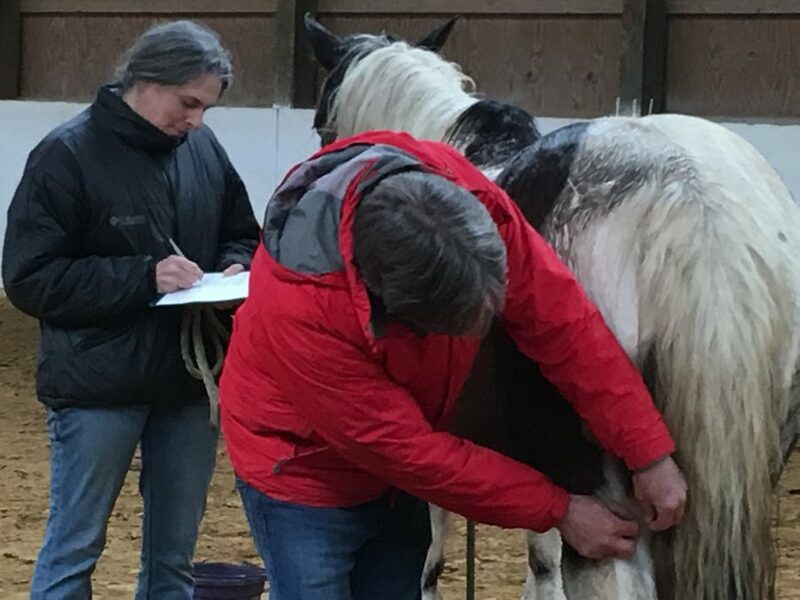 Angus received his first acupuncture treatment today for his diagnosis and I have complete confidence that Dr. P and I will be able to heal him together and get him back to a truly happy healthy horse. I am relieved that I was able to intervene on Angus’ behalf and help him be understood. I only have just about a couple weeks left in his re-starting program and have put him on the road to a well horse.